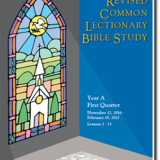 The Revised Common Lectionary Bible Study is designed for personal or group study of the weekly Bible Scriptures using the lectionary readings that are common in many churches. Available in individual three-month booklets or a Yearly Subscription of four quarterly books, sent automatically every three months. Order product here. What is the Lectionary Schedule? Many churches use Scriptures selected from the Lectionary (a three-year cycle of Scripture readings from the Bible), so that everyone in the church will have a common background and understanding of the Scriptures. Read more about the Lectionary here. What makes “The Revised Common Lectionary Bible Study” different from other Bible studies? At the time that we developed “The Revised Common Lectionary Bible Study,” there was no Lectionary Bible study available that required much interaction on the part of the participants. Most existing Bible studies were commentaries on the readings. We wanted each participant to personally search the Sunday Bible readings to see what was happening, who was involved, who was absent, and what lessons could be be learned. We wanted each participant to understand how to apply these lessons to everyday life. We also wanted the first questions in each section to be easy to answer so that those who were not familiar with the Bible would feel a degree of success in answering the questions. “The Revised Common Lectionary Bible Study” is helpful to all parishioners who want to understand and learn more about the Sunday Bible readings. Why is this a good choice for group study? Many churches and individuals have used The Revised Common Lectionary Bible Study as the basis for a class, either for believers who want to understand the Scriptures read in church, or as an outreach to people who are interested in exploring Christianity. You can explore and download our study guide: “How To Lead A Bible Study” here. Explore a Sample Lesson: Check out a lesson from The Revised Common Lectionary Bible Study, and see for yourself how simple and effective it is. Download a Sample Lesson. 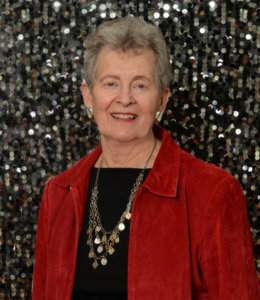 Paraklete Press was founded by Elizabeth C. Chapman in 1989, who saw a need for BIble Studies based on the Lectionary Scripture selections read every Sunday in many Churches. These studies help make the Scriptures easier to understand, explain historical and cultural background and encourage the participants to apply these Scriptures to their daily lives.